…And now, thanks to The Loopy Ewe, I think I finally can! I can’t WAIT to show you what this is going to be! 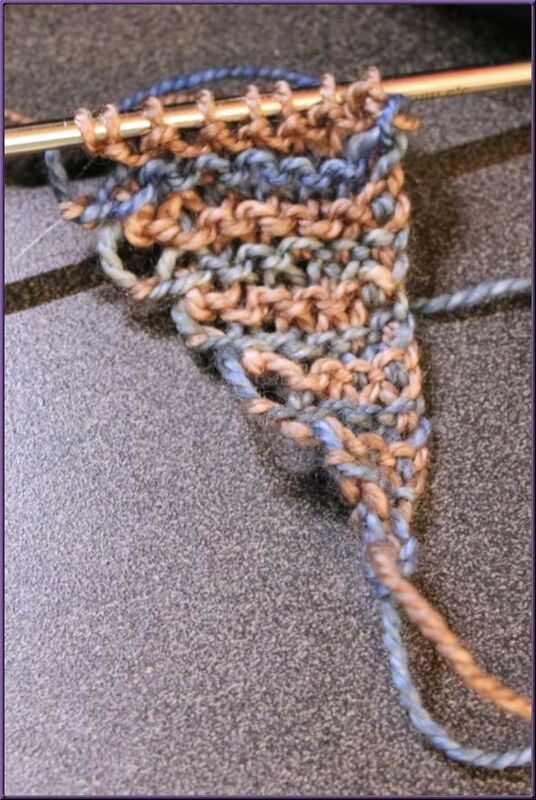 This is the beginnings of the Mini Mania scarf by Sarah Core. 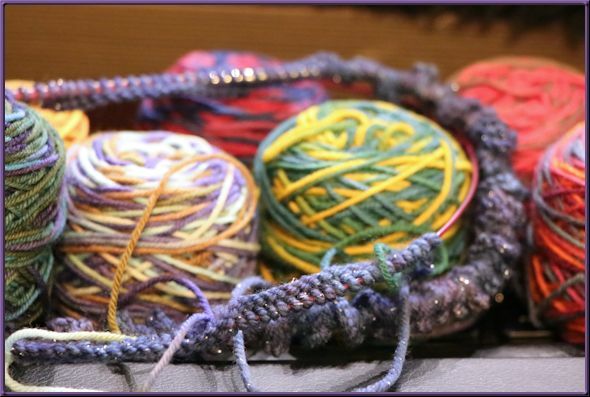 It is the answer to what to do with all of the little leftover bits of yarn, when you only have enough left for a row or two, and yet, you can’t bring yourself to throw it away. Even small amounts of yarn are good for something, right? Yeah, they are. So I started casting on about a week ago. I do hate that part of any project, and tend to pick ones that start by only casting on a handful of stitches and growing from there. But if I were going to do this project, I wanted to do it BIG, so I cast on somewhere in the neighborhood of 600 stitches. I say “somewhere” because even with using a counting device I think I forgot to push the button a few times, so there may, in fact be MORE than 600 stitches. Yes, I think I’ve lost my mind. And I am pretty sure this project will take years to complete. But it can be a “go-to” project when everything else I’m working on bores me. 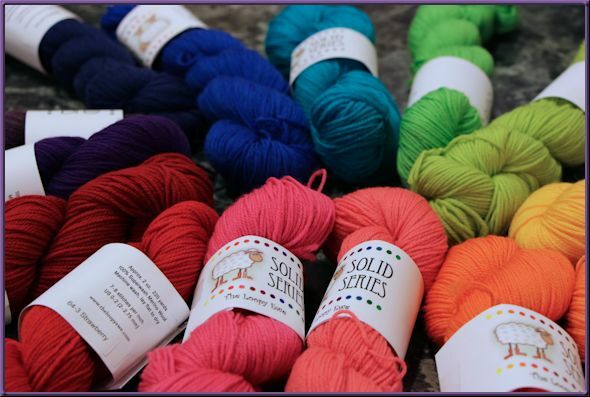 This would probably bore me, too, except I’ll be changing yarns every couple of rows. So, we shall see. I imagine only periodic photos of this bit of knitting insanity will appear, so don’t hold your breath waiting for them! At the same time, wish me luck. I would actually like to have this finished someday. I don’t know what it is with me and my knitting. I am the queen of false starts. I am wanting to make another gift shawl. Since I am working on my own Color Affection, I knew this time I wanted to do something different. So, I opted for Taygete, a shawl by Romi Hill. It features garter stripes, with which I have become oh-so-familiar, but they will be running vertically, from side to side, across the body of the shawl. 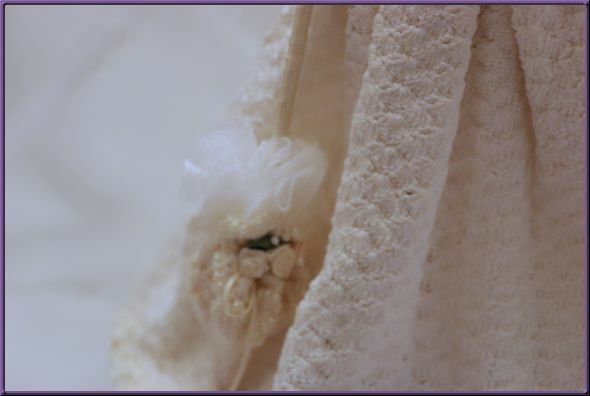 Then the bottom has this little bit of lace for elegance, which I think is pretty and doesn’t look too challenging. We shall see how it goes. Of course the first conundrum was choosing colors. I feel like I know the recipient pretty well, or as well as she lets anyone know her, but when it came to choosing colors, I had a really hard time. I actually like the sample that the designer created, but could not find those colors online. 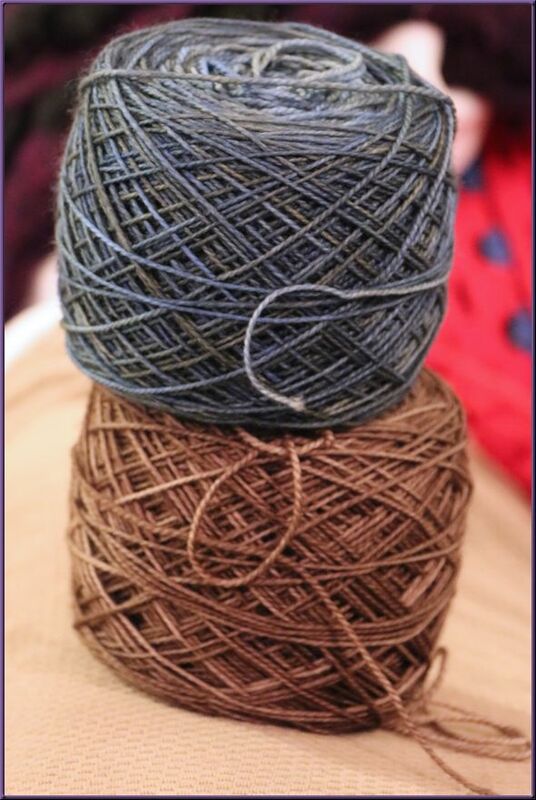 So, I started looking on Ravelry for examples, to see what others have made. There were some stunning examples, and then there were a few that just made me scratch my head and realize, of course, that color preference is in the eye of the beholder. 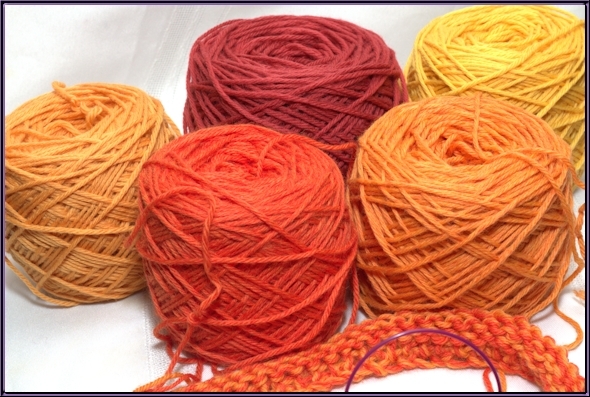 I bought yarn colors a total of three times before finally settling on my choice. 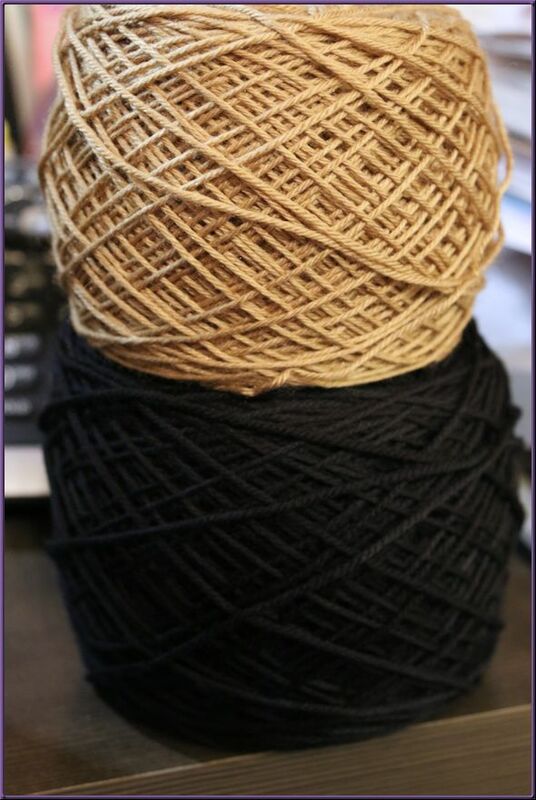 Then my next thing to ponder is this: which color should be the lace color, and which should be the contrast color? 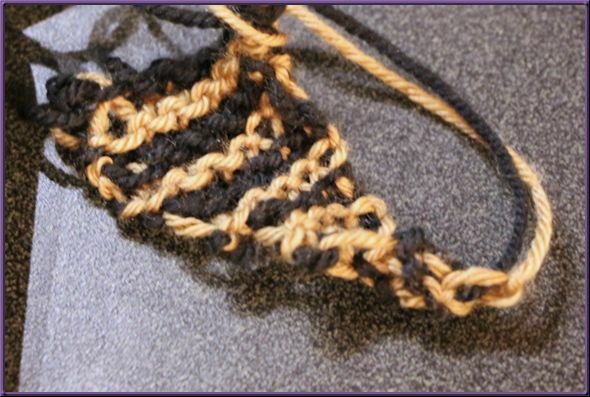 When I read the pattern initially, it said it took all of the yardage in the one color, so I made sure to get two balls of each because I am a loose knitter, and i haven’t for sure yet decided which color should be the lace section. Right now I’m leaning toward the blue, but I’ve heard a convincing argument for the other. Oh, well, it feels like the knitting is going a bit slow for this project so I probably have a while to decide. And maybe, since I have extra yarn, I’ll make it a wee bit bigger, too. Romi has given very clear instructions for that. And with that, I’m putting needles down. It’s late, even for me. Goodnight! My grandmother on the Humphrey side was an avid crocheter, and was eager to help me expand my collection. 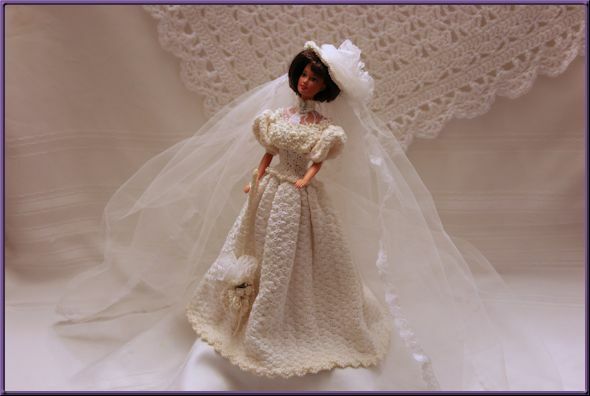 She had found a book of “Gibson Girl” Barbie bride patterns to crochet, and asked me to pick my favorite for her to make. She said it was a delayed wedding gift. I stewed over the patterns for an entire weekend before choosing, and my grandmother lovingly set to work. My grandmother fell ill during the making of this precious gift, and eventually she was not able to work on it any longer. 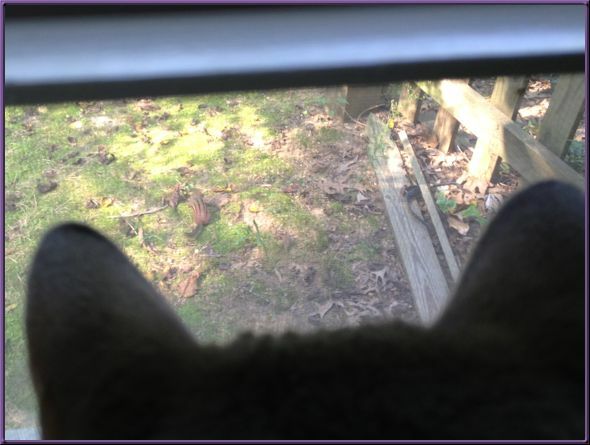 The stitches and beads were so tiny that it had become hard for her to see them. 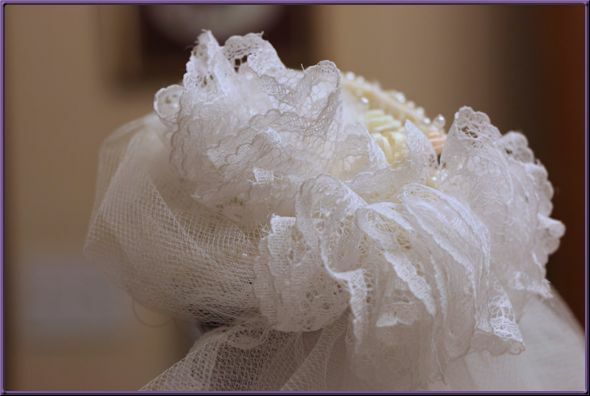 The project was mostly all crocheted up and it was a matter of the detail work, I was told. Eventually she hoped to feel well enough to finish it. Sadly, it was not to be. My grandmother died before the project could be finished. I would have accepted the article in any state of completion, but it was not offered to me and I never saw it. Another relative took possession of most of my grandmother’s crafty things and I never knew what became of it. Fast forward to now. 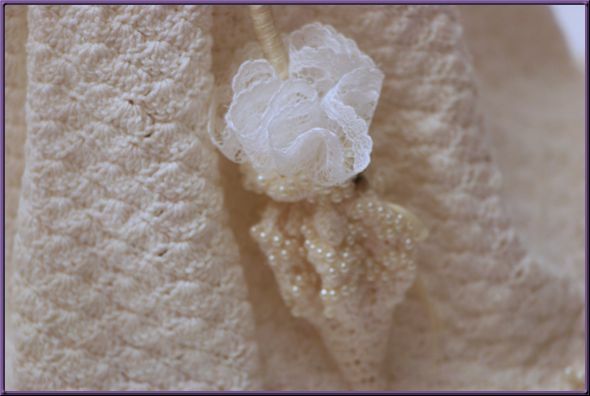 Apparently some time recently I had relayed the story of the lost wedding gown to my friend who specializes in doing needlework on very tiny, delicate objects. I can’t remember how or why I told the story but my friend picked up on my sense of sadness which I still hold to this day. And so she made for me a lost treasure, which now fills the space in my heart that would have been filled by my grandmother’s gift, if I had been allowed to have it. 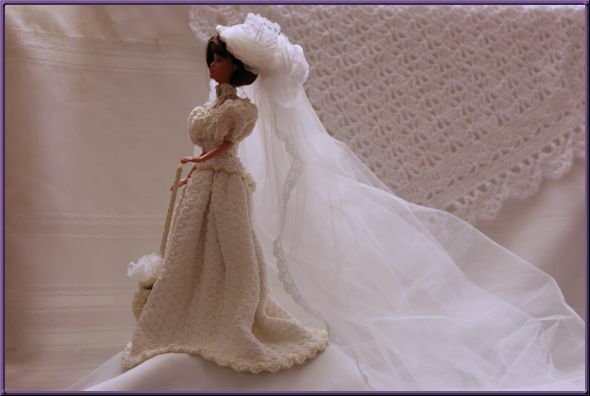 This bride is different from the one my grandmother was making, but she is every bit as exquisite and detailed. Here are more photos of my beautiful treasure. Here is a view from the side. 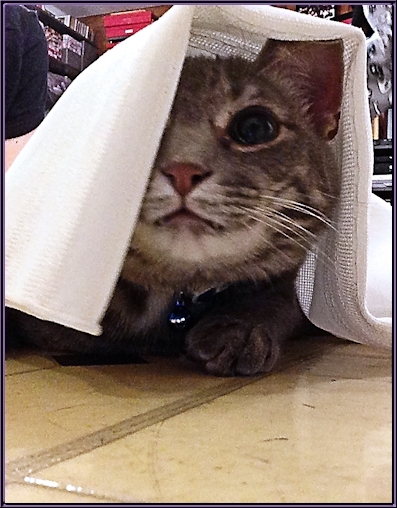 Just look at that expanse of veil! And it is all trimmed in lace. 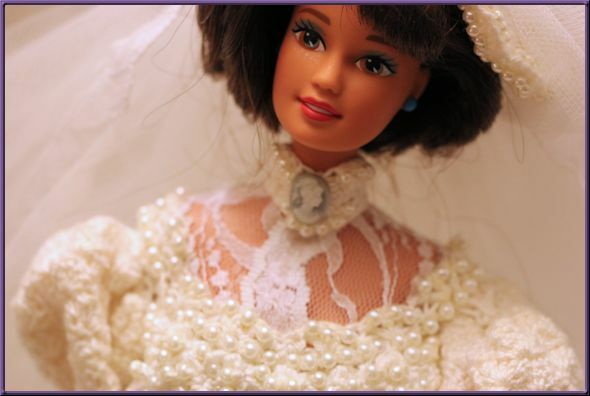 Here you can see all of the pearls at the bodice and neck, the delicate fabric, and a tiny cameo pin at the neck. Exquisite! Notice all of the beautiful shell stitches in the skirt. 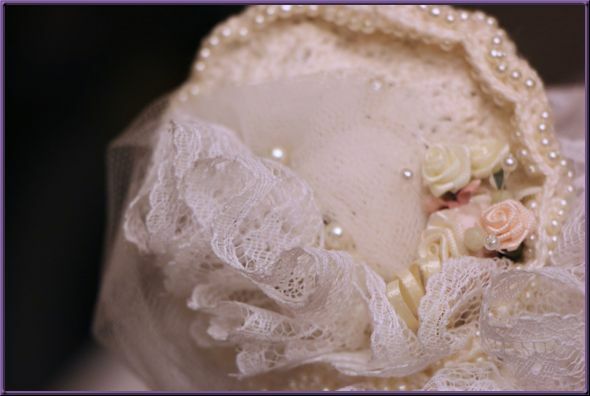 Even the top of the hat is detailed with tiny roses and seed pearls. I love the variation of colors in the individual flowers. The artistry that went into the piece is astounding. And, that the maker knew just how much this gift would mean to me makes it all the more amazing. Saying “thank you” a thousand times would never be enough. And I thought this was going to be just another crappy Monday. Boy, was I wrong.